The Aphrodite Apollon Spa Park is located in Sant’Angelo of Ischia, in one of the most beautiful and romantic places on the island surrounded by tropical plants and flowers. At this Spa the hospitality is guaranteed by very attentive staff in each part of the oasis where the guest is at the center of attention. It has 12 swimming pools with thermal water at a temperature that ranges from 20°C to 40°C, 2 seawater swimming pools and one covered jacuzzi. The waters are not treated with any chemical that lightens the color or reduces the effectiveness of it and the pools are emptied and cleaned every day to ensure total hygiene and freshness. You can have lunch or snacks at the local Bar-Restaurant with a splendid terrace overlooking the sea where you can try typical local dishes and fresh seafood. The thermal department has an original sauna in the Natural Cave and you can have different cosmetic treatments in the Beauty Centre meanwhile the thermal treatments are available in the Terme Linda which is also located on the park territory. But the most precious thing is the private beach, equipped with sun loungers and beach umbrellas, a fitness corner and beach volleyball court located within walking distance. It is very easy to forget about everyday life and to leave any stress behind in this place. 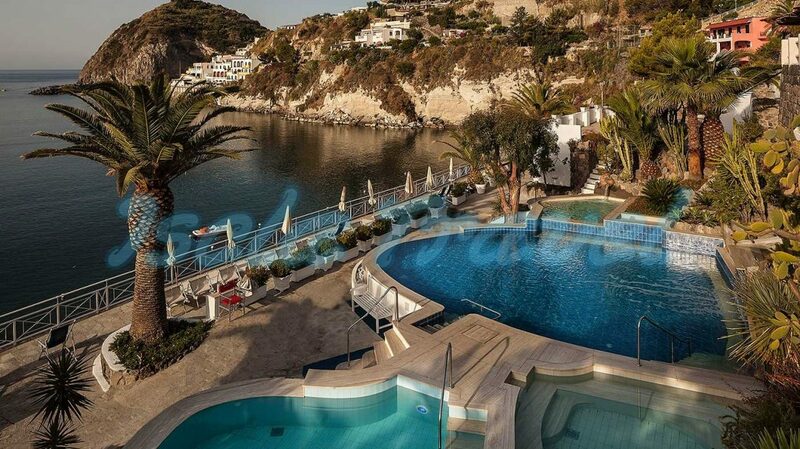 Here you just have to admire the panoramas the degrading terraces facing the sea. There is also a swimming pool for children and a wonderful play corner for their fun. Do you need more information to visit the "Thermal Park Aphrodite-Apollon"?